Inside Bordeaux’s Grand Synagogue of the Gironde. On a recent trip to the Basque, my husband and I learned a great deal about the strong Jewish presence that formerly existed in the region. The Basque country comprises southwestern France and northeastern Spain. Our journey started in Bordeaux, France, which, strictly speaking, is not part of the Basque. Rather, Bordeaux is the capital of the neighboring Aquitaine region. 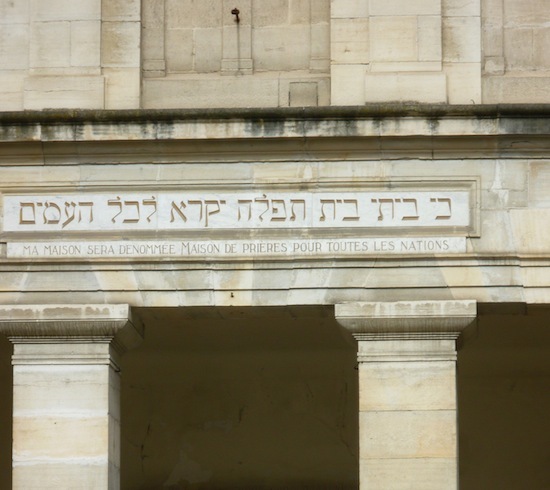 Our sightseeing there included a visit to the Grand Synagogue of the Gironde, located in central Bordeaux, serving a Jewish population of 1,100. A 2007 brochure given to us on our visit, History of the Jewish Population of Bordeaux, dates the synagogue back to the 1880s, the land for it having been a gift from the city. On the morning of our visit, a young man, soon to be a bar mitzvah, was just finishing his practise session on the bimah, which gave life to the building. From Bordeaux, we traveled by train two hours southwest to St. Jean de Luz, a mid-size town on the Atlantic coast that is part of the French Basque, where we had rented an apartment. We found our most substantive Jewish Basque connection on a day trip to nearby Bayonne. Musée Basque et de l’histoire de Bayonne has quite an interesting collection of Jewish artifacts. Musée Basque et de l’histoire de Bayonne is a modernized space housing the history and culture of the people of the region. Within, there is a special exhibit that celebrates the presence of Jews in the Basque since the 1600s. The roots of the Jewish community there stem from the migration that took place when the Jews were expelled during the Spanish Inquisition. Among the collection of artifacts is a beautiful portrait of Augusta Furtado, who, in the 17th century, was a merchant and president of the Israelite Consistory of Bayonne, as well as twice serving as Bayonne’s mayor. 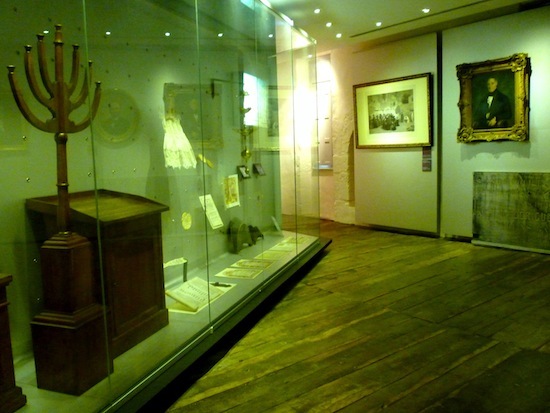 The collection also includes furniture and religious objects from a private synagogue in the 19th century, including an ark, menorah and pulpit, a child’s temple presentation dress, circa 1885, a shofar, an 18th-century mezuzah and a sabbatical lamp from a Portuguese ceremony that was used in Bordeaux and Bayonne. One of the most interesting items is a document dated Jan. 19, 1753, entitled The Statues of the Jewish Nation of Saint Esprit, a reiteration of the royal protective orders of 1550 in which the title Jew is used for the first time instead of the term New Christian or Portuguese. A further Jewish connection in the region has to do with one of the sources of Bayonne’s current fame as a world centre for the manufacture of high-quality chocolate. The chocolate-making skills of the exiled Spanish Jews who settled in the area were put to use. Their contribution to the industry is told at some length in the self-guided tour of the city’s delightful l’Atelier du chocolat. Both my husband and I felt compelled to enjoy a generous chocolate-tasting at the atelier out of respect for our ancestors! 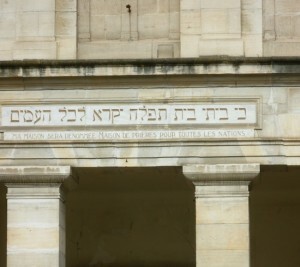 Bayonne’s synagogue is all locked up, but this inscription is clearly visible on its exterior. Our last daylong outing – to Saint-Jean-Pied-de-Port, France – metaphorically closed a circle for us with respect to early Jewish life in the Basque region. These days, it seems, almost everyone knows someone who has undertaken the six-week walk referred to as the Camino de Santiago (the Way of Saint James). This medieval pilgrimage runs from Saint-Jean-Pied-de-Port, near the Spanish border, more than 750 kilometres northwest of the Spanish city of Santiago de Compostela. There is generally a degree of wonderment and respect accorded to anyone who has retraced those steps. 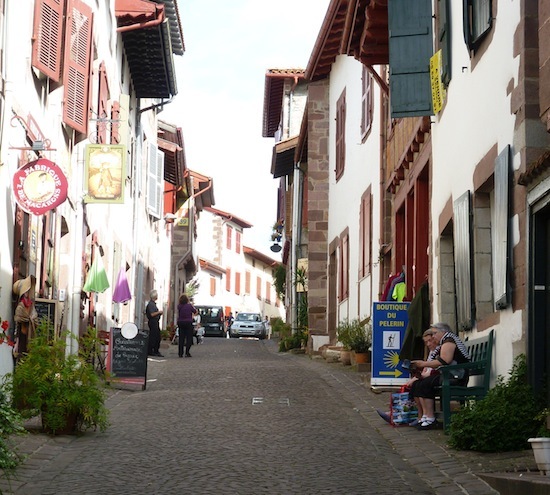 One has only to walk the steep main street of Saint-Jean-Pied-de-Port to understand that there is a hardship to be endured no matter how solid one’s walking shoes or how well-organized is today’s network of rest places along the route. Being in Saint-Jean-Pied-de-Port surrounded by modern-day pilgrims at the start of their journey brought to my mind how different their trek would be to that of the expelled Spanish Jews. I could not help thinking what it must be like to have to flee one’s home under threat of death, travel on foot, by cart and, for some, partially by boat, to hopefully reach the safety of new lands. These Jewish travelers had no fancy walking shoes, no “service centres” along their route and they most certainly traveled with fear in their hearts. Saint-Jean-Pied-de-Port is the starting point for the Camino de Santiago pilgrimage. My husband and I left the Basque knowing that there were likely many other remnants of a Jewish presence in the area yet to be discovered. Our curiosity peaked, it’s a challenge we will hopefully be able to take up on a future visit. Karen Ginsberg is a travel writer living in Ottawa. 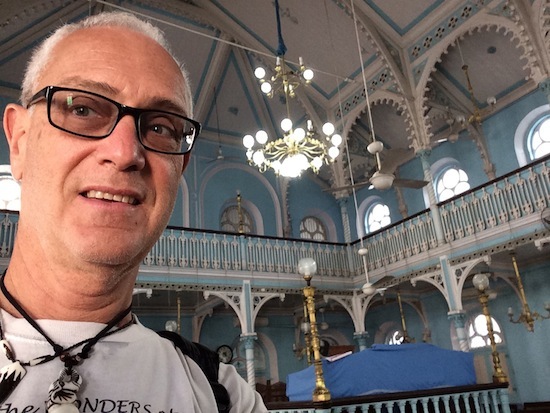 Steven Finkleman in front of the restored Chennamangalam Synagogue. I had bought my airline ticket to Mumbai in the fall, aiming to track down the remains of the Jewish community in India. I set out with my backpack on Jan. 9 and, after several days, arrived. I had pre-booked a stay at Sassoon House, which is a residence for Jewish travelers at Magen David Synagogue in Mumbai. Lufthansa pulled in at 2:30 a.m. Perfect time for arrival into a strange city of 18,000,000 people. Somehow, I found a taxi and a Western traveler who wanted to share the ride with me. And, somehow, I managed to give some direction to the synagogue, which is currently situated in the predominantly Muslim district of Byculla. It does take a bit of guts. We pulled into the synagogue compound around 3:30 a.m. under the watchful eyes of Mumbai’s finest, accompanied by huge spotlights, army tanks and AK47s (all in response to the terrorist attack at a Mumbai synagogue five years ago). I was as cool as a cucumber. My taxi partner at this point was in apoplectic shock. Fortunately, Mr. David, the caretaker of Sassoon House did answer the phone and let me in for four hours of rest, prior to attending the Shacharit service for Shabbat at 8:45 a.m. Interesting service. I was #11 in attendance, so was superfluous to the congregation. (I often have been #10 in these circumstances, serving as the final man needed to allow the service to proceed.) The service was rapid, Sephardi Orthodox, and the accent of the Baghdadi congregation made following along somewhat challenging. The familiar tunes of the Barchu, the Shma, the Amidah, the Aleinu, were absent and keeping up with the service required heavy concentration on my part after a 36-hour flight and four hours of sleep. I received an aliyah to the Torah and, when I gave my name as Zalman ben Yaacov, Zalman being a Yiddish name and, therefore, totally unheard of in Mumbai, they interpreted my name as Solomon, and called me up as Shlomo ben Yaacov. Lunch at the rabbi’s home followed. Considerable gin was flowing (considering it was a former British colony) accompanied by lots of traditional Judeo-Marathi songs. I was forced to sing a representative Canadian song and led them all in a rousing version of “Allouette.” The luncheon ended with everyone sharing some snuff! As they all snorted away, I was sure to ask, “Are you certain that this is only tobacco?” before trying some myself. The Indian community goes back about 2,000 years. Some date it to the expulsion after the destruction of the First Temple, others to after the destruction of the Second Temple. The community has four components. The Bene Israel and Cochin communities came both around the same time. The Cochin community was likely from seafarers and merchants, possibly dating back to King Solomon’s time. The Bene Israel community around Mumbai dates from a shipwreck 2,000 years ago where seven men and seven women survived. Their holy books were lost, but they remembered to keep the Shabbat, kashrut and brit milah. Generations later, they were tutored by the Cochini community to improve their knowledge of Judaism. The third community to arrive was the Paradesi community. Paradesi means foreigner, and this group was basically Sephardim who arrived from Spain or via Amsterdam in the 16th century, and headed to Cochin. The fourth group, led by David Sassoon, emigrated from Baghdad, and came in the 18th century, setting up congregations in Mumbai, Pune and Ahmedabad. The Sassoon dynasty was very dynamic both for the Jewish community and the Mumbai community at large. There are several residual synagogues in Mumbai, with some still in use, such as the Baghdadi community’s Magen David (where I stayed) and Keneseth Eliyahoo, along with the original Bene Israel community’s Tiferet Israel synagogue. Five thousand Jews remain in Mumbai, and three or four synagogues hold services on Shabbat. Tiferet Israel has a strong component of younger men. Inside Keneseth Eliyahoo Synagogue, downtown Mumbai. I was lucky to travel to Cochin (now called Kochi) in Kerala state and, besides spending a wonderful day in Jewtown, Cochin, and visiting the Paradesi synagogue, I also rented a taxi and went to search out the remnants of the Jewish community in more remote areas. I visited two restored synagogues at Parur (or Paravoor) and Chennamangalam (or Chendamangalam), and I visited the Kadavumbagan synagogue in Ernakulum, which was closed 40-50 years ago and remains unrestored. There are about 12 Jews left in Kerala. I spent two days visiting Sarah Cohen. 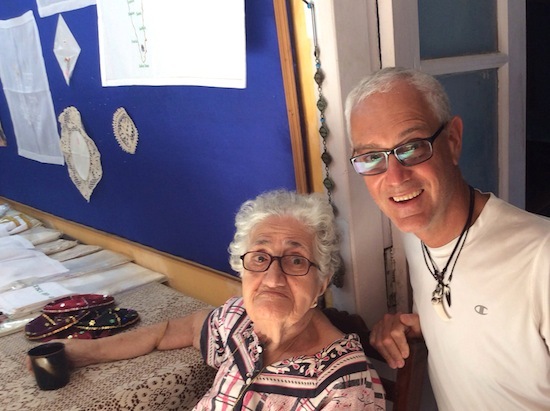 Sarah, 91, is the matriarch of the Cochin Jewish community. 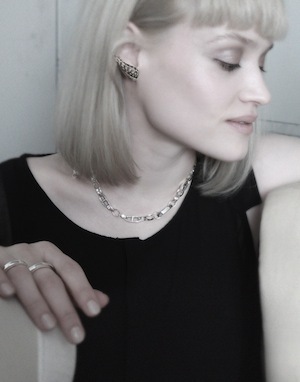 She reminded me totally of my Baba Sarah. On my first visit, I asked her if I could bring her anything that she needed. She asked for chocolate and beer, and I returned the next day with some Cadbury. Sarah has an embroidery shop on Jew Street in Jewtown, in the city’s Mattanchery neighborhood, two blocks from the Paradesi synagogue, which is spectacular – it is a national historic landmark, expertly renovated and with excellent historical information. The author visits Sarah Cohen in her embroidery shop. I was also able to meet Elias Josephi at the Kadavumbagan synagogue. About 50 years ago, the synagogue disbanded because of lack of membership and Josephi purchased it. He currently runs a plant nursery and an aquarium/fish shop in the antechamber of the synagogue. Behind his desk, the closed door leads to the treasure of the sanctuary, exactly as it was left 40-50 years ago. At the peak, there may have been about 100,000 Jews in India. Eighty percent of them emigrated to Israel in the 1950s/60s. It is interesting that they remained separate. The Cochinis went to Nevatim and the Bene Israel went to Dimona, Ashdod, etc. Fifteen percent of the Indian Jews went to English-speaking countries such as the United States, Canada, the United Kingdom and Australia, and five percent remain in India today. What a fascinating Diaspora story. How intriguing that at all ends of the earth, one can find Jewish communities. I believe it was one of our sages who once said, “If there is oxygen, there are Jews.” Or, perhaps, it was me who made up that line! Steven Finkleman, originally from Winnipeg, is a retired pediatrician living in Kelowna. He travels extensively and often researches and visits remote Diaspora communities on his adventures. Dr. Neil Pollock specializes in circumcision, from newborn to adult, and adult vasectomy. As a leading expert in circumcision, he has traveled around the world to train physicians and, this summer, he will head to Port-au-Prince, Haiti, to teach a team of doctors in medical newborn and infant circumcision. In 2008, Dr. David Patrick was the head of the B.C. Centre for Disease Control. 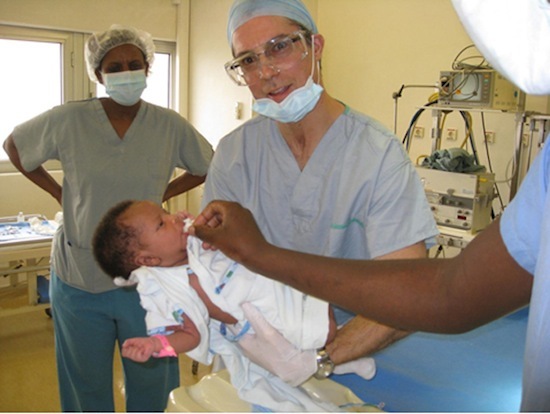 Pollock said he was asked by his colleague “to teach my surgical techniques for circumcision in Rwanda, where they were using scissors and stitches, without anesthetic, and their surgeons desperately required training in an alternative quick, safe and painless infant circumcision technique that would be accepted by their population. In coordination with their surgeons, I planned with my team a five-day surgical training mission that year and flew to Rwanda. I have been in contact with these surgeons by email since my trip and they have informed me that they are using my technique effectively and safely throughout the country now. Klausner, a professor of medicine in the division of infectious diseases and the program in global health at UCLA, is an advocate in the use of medical male circumcision for the prevention of sexually transmitted diseases and HIV. He volunteers with GHESKIO, an organization run out of the Centre for Global Health at Weill Cornell Medical College in partnership with the Haitian government. Operating primarily in Port-au-Prince, their work is supported by Haiti’s first lady and has a mission to combat HIV and improve conditions of maternal and child health. GHESKIO will host Pollock’s training in Port-au-Prince. Raised in Winnipeg, Pollock explained that he decided to become a doctor “because I had a strong interest in sciences, medicine and surgery from a young age.” Early in his career, he decided to create a special focus on circumcision and vasectomy, and built a highly focused practice and a well-tested – and respected – technique. “My interest in developing a safe, quick and painless approach to circumcision for the medical community in B.C. arose initially from some of the rabbis approaching me approximately 20 years ago and encouraging me to become a mohel in Vancouver,” Pollock said. The benefits of newborn and infant circumcision are many, but the rates of the procedure vary from region to region, and remain contentious to those opposed to what’s seen as elective (non-consenting) surgeries for babies. Pollock noted, “The most important change recently in how the medical community has come to view circumcision is expressed in the … consensus statement from the American Academy of Pediatrics released in late 2012 declaring that ‘the medical benefits of infant circumcision outweigh the risks.’ This is the strongest statement of support ever issued by the American Academy of Pediatrics. Rwanda and Haiti share a history of national trauma, which has led in both countries to poor health outcomes. In 1994, at least 800,000 Rwandans were massacred by their countrymen in a genocide. In 2010, Haiti, already the victim of more than two centuries of extreme poverty, dictatorships and U.S.-led military interventions, experienced a 7.0 earthquake that resulted in the deaths of more than 100,000, and displaced 1.5 million of the tiny country’s 10 million people. Since then, Haitians have been hit by serious outbreaks of preventable disease, including cholera, tuberculosis and AIDS. According to the United Nations, life expectancy is 61 years for men and 64 for women. To make a donation, contact Dr. Neil Pollock at 604-644-5775 or [email protected]. “We will make it very easy for people to donate, and make arrangements for their cheques (made payable to the Vancouver Foundation) to be picked up by our team,” he said. Donations can also be mailed to 4943 Connaught Dr., Vancouver, B.C., V6M 3E8. A horse figurine is evidence of early Jewish ritual practice. One might think that a significant archeological find a few hours’ walk from Solomon’s Temple in Jerusalem would turn up artifacts we would recognize as Jewish. But since the Judaism of the day was not what we know, the find yielded ritual objects that seem vaguely pagan, almost heretical by today’s standards. Shua Kisilevitz, the archeologist who was part of the team that excavated the site at Tel Motza, about seven kilometres west of Jerusalem, prefers the phrase “pagan Yahwism” to describe the religion of the era. 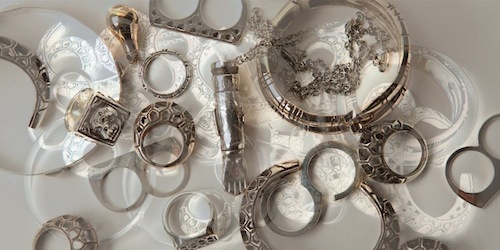 Last December, Kisilevitz and three fellow archeologists announced what they called an “unusual and striking” find, unearthed in construction for a highway: the 2,750-year-old walls of a temple, along with a cache of ritual objects that included a pedestal decorated with lions and sphinxes, pendants, pottery and vessel fragments, and figurines – two human and two animal – that may or may not have depicted deities. The dig provides “rare archeological evidence for the existence of temples and ritual enclosures in the Kingdom of Judah in general and in the Jerusalem region in particular,” the team announced. The uniqueness of the find is even more remarkable, the archeologists said, because of its proximity to the First Temple, built, according to the Bible, under King Solomon in 960 BCE. But archeologists know little about the period’s religious practices because there are hardly any remnants of ritual buildings from the era, according to Kisilevitz. 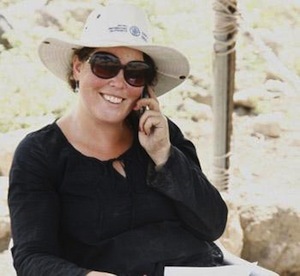 While more study is needed, the find provides valuable insights into what those rituals might have been, she said in an interview prior to her recent talk on the subject at the University of Toronto. While those practices may seem strange and un-Jewish today, they were in keeping with the rules of the time, Kisilevitz said. 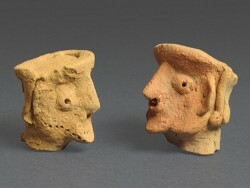 According to Shua Kisilevitz, artifacts such as these found at Tel Motza, are important because they reflect a formative time for Judaism. The find also conforms to biblical accounts, which mention local religious precincts outside Jerusalem, she added. And “Motza” is mentioned in the Book of Joshua as a town in the tribal lands of Benjamin, which bordered Judah. 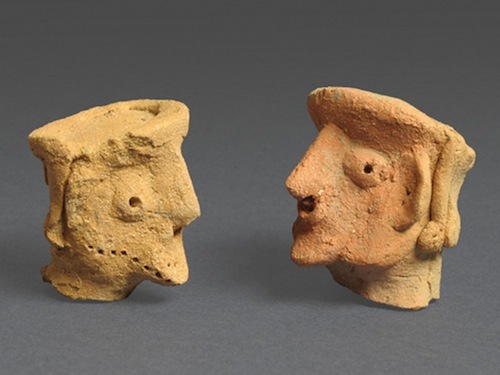 Kisilevitz, who works for the Israeli Antiquities Authority and is in Ontario for several months on an exchange with the University of Toronto, said the team does not know whether the human and animal figurines served a religious purpose. “It’s kind of tricky and a little bit hard to say,” she noted. The archeological team believes the temple at Tel Motza must have functioned before religious reforms enacted in the times of kings Hezekiah and Josiah, which abolished all ritual sites outside Jerusalem and concentrated religious practices solely in the Temple. Ron Csillag is a Toronto freelance writer. A version of this article was originally published in the Canadian Jewish News.